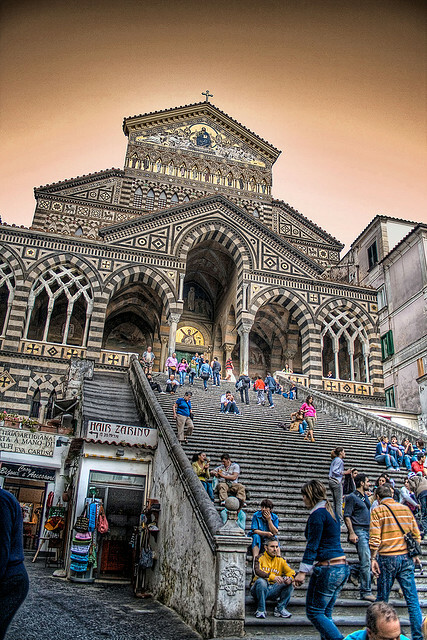 Amalfi is a town and comune in the province of Salerno, in the region of Campania, Italy, on the Gulf of Salerno, about 47 kilometres (29 miles) southeast of Naples. It lies at the mouth of a deep ravine, at the foot of Monte Cerreto (1,315 metres, 4,314 feet), surrounded by dramatic cliffs and coastal scenery. The town of Amalfi was the capital of the maritime republic known as the Duchy of Amalfi, an important trading power in the Mediterranean between 839 and around 1200.